Banbridge athlete Emma Mitchell's plan to make her marathon debut in London next month has been dashed by a calf muscle tear. The Northern Ireland 5,000m and 10,000m record holder's training in recent weeks has been restricted largely to aqua jogging because of the injury. After consultation with coach Eamonn Christie, the 25-year-old has now pulled out of the 28 April event. "Emma had a small tear in her soleus muscle," Christie told BBC Sport NI. "It meant no running as we took the cautious route to get her back stronger with aqua jogging and some light strength and conditioning work. "It's all healed now with her able to bear weight again so Emma will be back to easy running from next week. "But we both feel she has missed too much important training for her to still run in London." Mitchell's immediate focus in the coming weeks will be to prepare for the track season which will include her outing at the annual Night of the 10,000m PBs run by Highgate Harriers in London, which this year takes place on 6 July. The county Down woman broke Teresa Duffy's Northern Ireland 10,000m record by almost 42 seconds at the meeting in 2017 before improving it by a further two seconds to 32:49.91 at last year's Commonwealth Games. However, Mitchell remains committed to moving up to the marathon and the plan now is for her to make her debut over the 26 miles and 385 yards distance in Berlin in late September. In addition to competing for Northern Ireland at last year's Commonwealth Games, Mitchell also represented Ireland at last year's European Championships in Berlin. 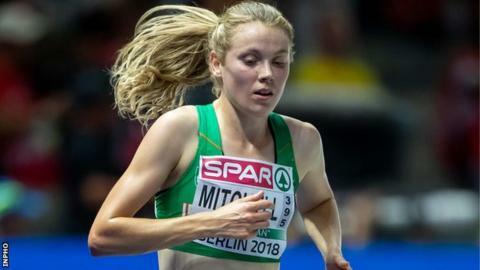 Mitchell achieved the 1500m and 5,000m double at the Irish Championships in 2017 and retained the 5,000m title last July, when she also took third in the metric mile won by her former training partner Ciara Mageean.